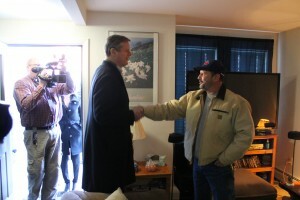 PITTSFIELD: During a visit to western Massachusetts over the weekend, Governor Charlie Baker and members of his administration met with veterans and staff at Solider On’s housing and care facility in Pittsfield. 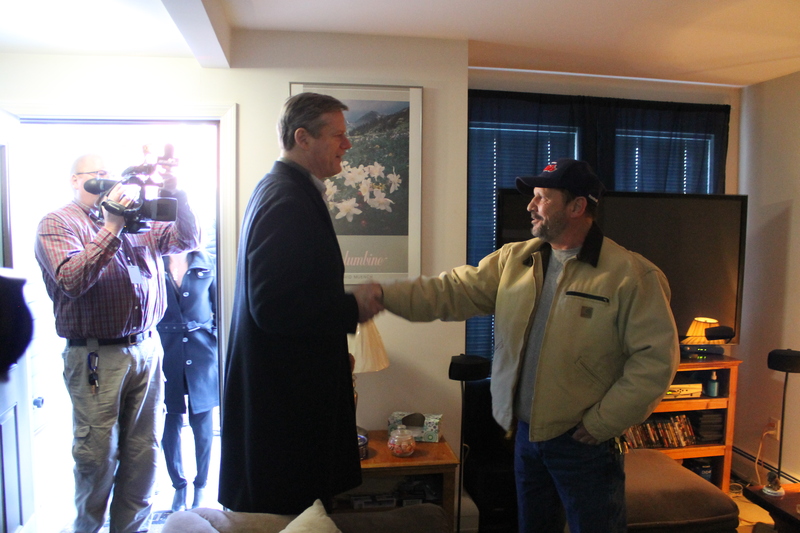 After touring campus apartments, Governor Charlie Baker sat down with area veterans at Soldier On’s transitional housing and homeless shelter. With a mission of ending veteran homelessness, CEO Jack Downing recalled the saying that changed his vision was that every American service member who put on the uniform made a pledge to die for the country. The 39 units at Soldier On’s Gordon Mansfield Veterans Community operate under a model allowing a veteran to own his or her apartment. Downing says the non-profit has found that veterans who have experienced homelessness or addiction feel safe and secure in communities with fellow veterans. Downing says they plan to open similar units in Northampton, Agawam, Chicopee, Albany, Jackson, Mississippi and at Fort Monmouth, New Jersey. Francisco Urena is Massachusetts new secretary of veterans’ services. The 34-year-old spent eight years in the Marine Corps and has a Purple Heart for injuries suffered when deployed to Iraq. Governor Baker says he will be constantly asking Urena and Secretary of Housing and Economic Development Jay Ash how Massachusetts can expand programs like Soldier On. According to the U.S. Department of Veterans Affairs, more than 370,000 veterans live in the Bay State. Urena says the main issue for his agency is not a lack of resources, but making people aware of and helping them access available aid. Governor Baker’s visit to the area days after being sworn in was meaningful for Dave Hastings, the superintendent of Southern Berkshire Regional School District and an Army veteran. To view article visit http://wamc.org/post/baker-administration-tours-soldier-discussing-veterans-needs.